Close to London Bridge on the South Bank of the River Thames, next to Guy's Hospital, this is an increasingly fashionable area, with many bars, restaurants, markets and creative businesses. Tate Modern, a contemporary art gallery. Prospective students may also wish to visit and tour the campuses. London Bridge (Northern and Jubilee Lines): 1 minute walk, Borough (Northern Line):10 minute walk, Elephant and Castle (Bakerloo Line): 25 minute walk, Bank/Monument (Northern Line):20 minute walk, Monument (District and Circle Lines):15 minute walk. Buses stopping in Tooley Street: 47. Buses stopping at London Bridge Station: 21 (24 hour), 43 (24 hour), 48, 149 (24 hour), 343 (24 hour), 381, N381, 521. Buses stopping at Borough High Street: 21 (24 hour), 35 (24 hour), 40, 47, 133 (24 hour). From the east, Woolwich Arsenal - Savoy: get off at London Bridge City Pier. 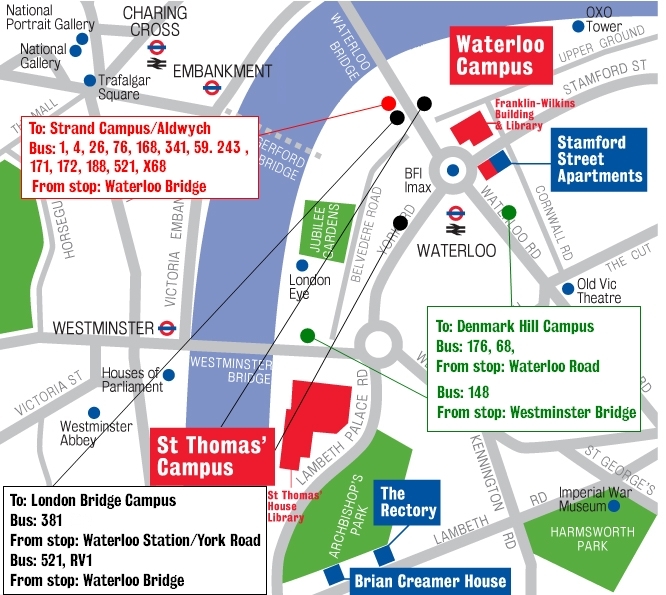 There is limited pay and display car park at the Guy's Campus, and Western Street, St Thomas Street and Snowsfield. The Campus has two secure bike parks available for staff and students with access activated on their university ID card. Nag’s Head Yard Secure Bike Park - 07.00-19.00, Monday to Friday (the bike park is locked outside these hours). From the Strand Campus 35 minute walk: walk down Surrey Street into Temple Place, along Victoria Embankment and cross Blackfriars Bridge. Walk along Blackfriars Road and turn left in to Southwark Street, crossing Southwark Bridge Road. Shortly after joining Borough High Street, turn right in to St Thomas' Street. 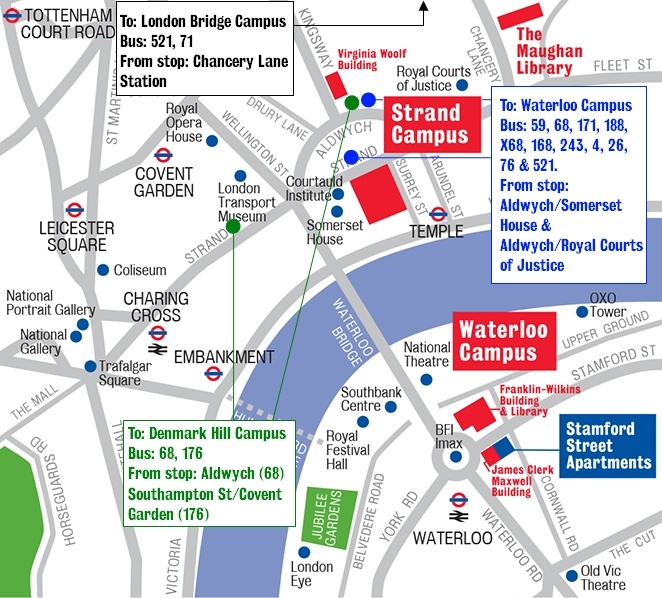 From Temple take the District or Circle line to Monument, then catch the 35, 40, 47 or 149 bus to London Bridge. Bus stops near the Strand Campus. From Temple take the District line to Westminster, and then take the Jubilee line to London Bridge. From Denmark Hill Campus n/a From Denmark Hill station take the 40 bus. Bus stops near Denmark Hill Campus. From Denmark Hill take the Southeastern service towards London Bridge. From Waterloo Campus From the Franklin-Wilkins Building on Stamford Street walk away from the IMAX Cinema towards Blackfriars Bridge. Cross Blackfriars Road and walk down Southwark Street, crossing Southwark Bridge Road. Shortly after joining Borough High Street, turn right in to St Thomas' Street. Take the 381 bus from Stamford Street to London Bridge. Bus stops near Waterloo Campus. From Waterloo take the Jubilee line to London Bridge. From St Thomas' Campus From St Thomas' Hospital turn left into Lambeth Palace Road, then right in to Westminster Bridge Road. Take the second left in to Baylis Road. Cross Waterloo Road and continue down The Cut. Cross Blackfriars Road and continue along Union Street. Cross Southwark Bridge Street and take the third left in to Borough High Street. Turn right in to St Thomas' Street. Take the 77 or 507 to Waterloo and then take the 381.. Cross Westminster Bridge to Westminster Station, then take the Jubilee Line to London Bridge.